The large complex of the Franciscan monastery is situated at the very beginning of Placa, to the left of the inner Pile Gate, next to the Holy Savior Church. The lateral facade of the monastery church runs along the principal street of Dubrovnik, and the monastery spreads north along the walls as far as the tower Minčeta. 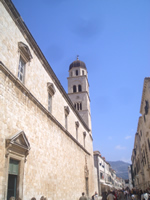 The Franciscan order arrived in Dubrovnik around 1234. The first Franciscan monastery was built in the 13th century in the Pile area on the spot what is today Hotel Hilton Imperial. However as the City was threatened with war, in 1317, decision was made to demolish that monastery (Franciscan Monastery of St. Thomas) to prevent its use by the enemy in the eventual case that the City might be besieged. The new monastery inside the City walls (Friars Minor monastery) was constructed the same year, in 1317, but the work on the monastery continued throughout centuries. The same year is taken for the establishment of Friars Minor pharmacy. The rule of the Franciscan order was to take care of the sick brethren. However this particular pharmacy was designed and founded as the public pharmacy, as well as for the needs of the monks, which is corroborated by the original location of the pharmacy being the monastery's ground floor. The establishment of the pharmacy provided a steady income to the order and solved their materialistic needs. Today the Friars Minor pharmacy is the third oldest functioning pharmacy in the entire world. 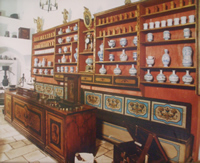 Since 1938, when the idea of a pharmacy museum was realized in the Franciscan monastery, curios visitors may enjoy the wonderful exhibits from the history of this noble trade. The large Franciscan church had been one of the richest churches in Dubrovnik at the time, when it was destroyed in the Great earthquake of 1667. The only element of the former building which has been preserved is the portal on the south wall. It was probably moved from the front to the lateral wall in the course of the restoration in the 17th century. According to the contract of 1498, this portal, the most monumental one in Dubrovnik at that time, was carved in the leading local workshop owned by the brothers Leonard and Petar Petrović. The portal has all the marks of the Gothic style, but the solid volumes of the figures show the Renaissance spirit. 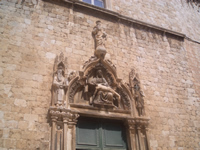 The figures of St. Jerome and St.John the Baptist are set above the door-posts, while the Pieta in relief is represented in the central Gothic lunette. The figure of the Father Creator is above the lunette. Such iconography of the portal and the choice of the patron saints are proof of the aspirations and social doctrine of the Franciscan in the political circumstances of the times. St. John the Baptist symbolizes Christian constancy in the face of the Turkish penetration. St. Jerome symbolizes the spiritual unity with the rest of Dalmatia. The Pieta symbolizes their compassion with the poorest members of the urban community who sought solace from the Franciscans, and the figure of the Creator on top should symbolize opposition to the humanist world-views of the time. The church was reconstructed in the Baroque style. 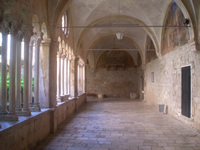 The northern wall of the church closes the southern wing of one of the most beautiful cloisters of Dubrovnik. 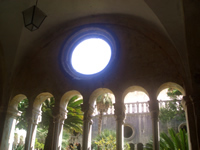 This cloister was built in late Romanesque style by master Mihoje Brajkov of Bar in 1360. The ambient is most harmonious, framed by a colonnade of double hexaphoras, each with a completely different capital. 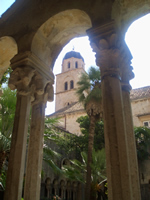 The Franciscan cloister is one of the most valuable late Romanesque creations on the Croatian shores of the Adriatic. 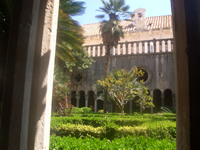 The Franciscan monastery has another cloister built in the Gothic style, but it is for private use only and not accessible to the public. 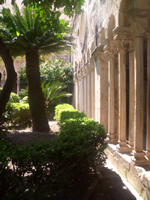 The cloister of Friars Minor Monastery is one of the most beautiful places one is able to visit inside the Old Town Dubrovnik. 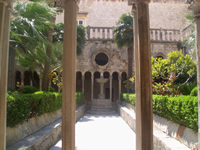 In combination with the valuable museum exhibits and the story behind Franciscan monastery and its centuries old pharmacy makes the Franciscan Monastery an unavoidable attraction of Dubrovnik, which every visitor should take time to experience. The monastery owns one of the richest old libraries in the Croatia, famous all over the world for the value of its inventory. The book collection consist of over 70000 books, over 1200 of which are old manuscripts of extraordinary value and importance, 216 incunabulas and 22 tomes of old church corals made from 15th to 17th century. The collection of liturgical and art objects is exhibited in the large Renaissance hall, containing the inventory of the old Franciscan pharmacy, paintings by old masters, valuable specimens of gold-work and rare books. Left of the entrance to the Franciscan church there is an ancient stone protruding from the wall with a face carved onto its surface. It is the end of the rainfall drainage system of the monastery. However the story about this face-carved stone in Dubrovnik is that it grants wishes! The face waits and listens: Whoever can climb this stone, take off and put back ones shirt while balancing on the stone, will have his wish granted! Some say it is true, the others say it is only an urban myth. Who can say who is right? It is worth a try! Can you climb this stone ? !